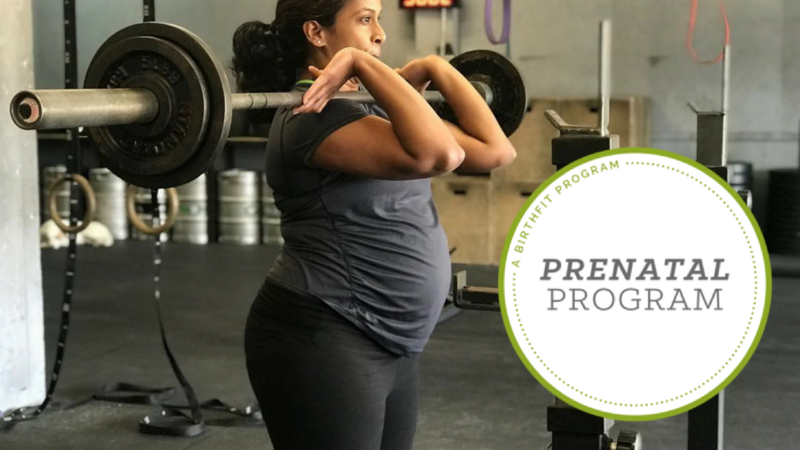 Our FULL TERM strength and conditioning training program for the woman who chooses to train efficiently and sustainably throughout her motherhood transition. We believe women should work out while they are pregnant. In fact, it is the most important time in your life to stay physically fit and nourish your body. Unfortunately in our society, there are a lot of misconceptions in regards to pregnancy, especially fitness. A lot of the information out there is outdated, with little factual knowledge. This program consists of four sessions per week for 37 weeks (weeks 5 through 42 of pregnancy). Most women join us just as soon as they find out they are pregnant or sometime in that first trimester. This could be anywhere from week 5 to week 12. Each session includes Warm Up, Strength, Conditioning, and Accessory Work. Content is accompanied by BIRTHFIT videos, explaining and demonstrating points of performance along the way. You will also find a bunch of extra goodies to keep your mind, body, and spirit growing and preparing for birth along with your body. After you have read the session content, watched the videos, and performed the exercises, don't forget to post your experiences, thoughts, frustrations, and encouragements in the comments to connect with our community and other new mamas on the same journey. *Optional. Technically, everything is optional but this is a strength and conditioning program designed with a barbell. Think. Journal. Think. Journal. Breathe. Warm up to a weight that is no greater than 70% of your 1 RM, or something you feel like you could 5-6 reps of confidently. Use this weight to perform 2 back squats every 45 seconds for a total of 12 sets. There should be no pausing in the bottom. The intention should be to touch the bottom and GO right back up. Drive through the whole foot (heels and big toe) and deliberately squeeze your booty at the top. This helps to keep that neural-motor pathway in action. Remember, this is not heavy. We only perform lifts we know we will make. Some of you are probably itching to get a little heavy. This is a workout in which you can play on the heavier side. However, you must always pick a weight that you know you can lift. At this moment in your life, there should be no doubt. Two years from now, this workout may have a different approach or intention, but not at this moment. For this workout, take the back squat from the rack each time. Be nice to yourself. Pick a weight that you know you can do 5 of but maybe not 8-10 reps. For the step-ups, pick a set up of dumbbells that are in the same category—heavy-ISH. And remember, this is relative to each of you. Your heavy may be way more than your friend’s heavy or vice versa. For this workout, women have done between 75lbs-200lbs for the back squat and between 15lbs-50lbs for Dumbbell Step Ups and Farmer's Carry. As you can see, there is a huge range. So, choose weights based on how your body is feeling today. Keep in mind the dumbbells you use for the step ups have got to stay in your hands a little longer for a 100’ (50’ down and back) farmer's carry. For a one-time purchase of $269, you'll gain access to our whole prenatal program. There will be four training days a week plus bonus BIRTHFIT education. to help you prepare your mind and body for birth. Most women start this program anywhere from 7 weeks to 15 weeks pregnant and train with us all the way through their pregnancy. If you crunch all the numbers, then that is around $9 a week or $2.25 a day for intentional training for birth. We are training mind and body for the most transformative event of our lives.